Mcdonalds is celebrating McDelivery Day on July 26! They started delivering in Canada through UberEat earlier this month! 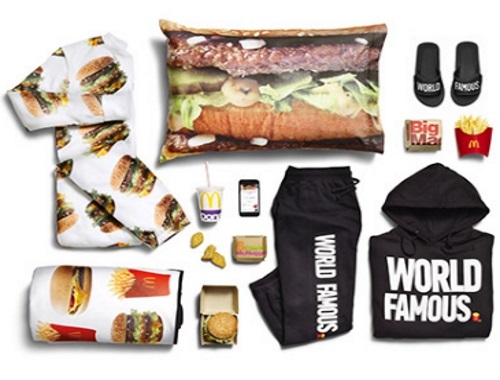 They have released a McDelivery collection which includes Big Mac onesie, a Big Mac pillowcase set, a burger and fries picnic blanket, World Famous Fries slide sandals and a World Famous Fries sweat suit. The items will be included FREE with random delivery orders this Wednesday July 26 via UberEats! Not all orders are guaranteed to include a free item, they are random! Items are first come, first serve, while quantities last. There are currently 187 restaurants eligible for McDelivery in Edmonton, Montreal, Ottawa and Toronto, with Calgary joining by the end of the summer. McDelivery prices are identical to restaurant pricing, but there is a $4.99 delivery fee and coupons are not accepted. To get started, download the UberEATS app for Android or iOS and the restaurants near you eligible for McDelivery will appear in the app. Not sure if it's valid still, but there is a $5 off Mcdonalds UberEats promo code that we blogged earlier, enter the code MCDS005 to get the offer. Click here for more info on McDelivery Day.